This is a comprehensive 7 days Rwanda safari where you get to explore all the national parks in Rwanda. 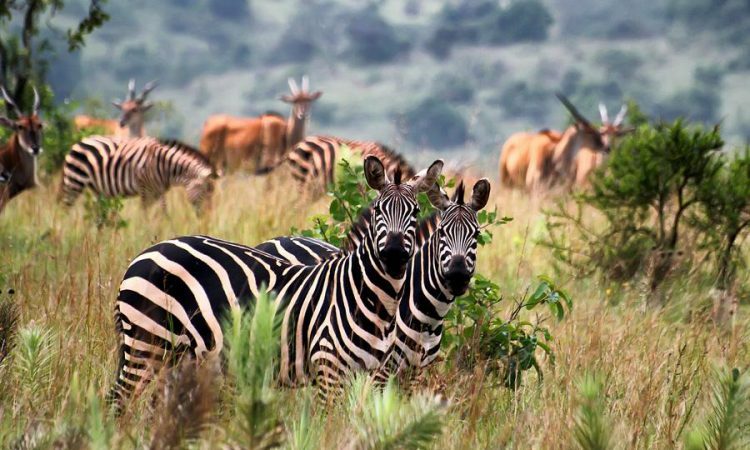 Game drives in Akagera National Park will allow you see various wildlife found in the park, at Volcanoes national park you will do golden monkey and gorilla trekking and you will end your tour in Nyungwe forest national park with chimpanzee trekking. Nyungwe is home to over 13 primates species which you will get to see during this tour. Upon arrival at Kigali, A representative from our Rwanda travel agency will meet you at the airport and you will be driven to your hotel in Kigali to check in. The second day of your Rwanda safari starts immediately after your breakfast with a transfer to Akagera national park. Upon your arrival at Akagera national park, you will check-in at the lodge/hotel. After having an exciting lunch with an option to try recommended local dishes, your guide will take you for a boat trip on Lake Ihema. While at the lake, you will have an opportunity to see a variety of water loving animals like hippopotamuses, Crocodiles and many bird species that live around the lake and the surrounding swamps. On the 3rd day of your Rwanda tour, you will wake up early and go for an early morning game drive. The mornings provide opportunities see many animals which rise early to graze and predators looking for their early morning kill. You will return to your hotel / lodge to freshen up and have lunch, and then pack up for the journey to Volcanoes National Park. Upon arrival at volcanoes national park, you will check-in to your accommodation and relax for the next day. Dinner will be served at the accommodation. After having a very early breakfast you will head for the volcanoes national park headquarters for a routine gorilla tracking briefing where you will be informed about the Do’s and Don’ts while on your gorilla tour. You will thereafter be allocated a gorilla group to track which is done randomly. You will then proceed in to the jungles of Virunga covered in thick rain forest to start your gorilla trekking encounter. The gorilla tracking exercise lasts for between 2 to 8 hours after which you will proceed back to the lodge for relaxation and lunch. Time permitting, your guide will take you to a local Banywarwanda community where you get to interact with the indigenous people in a thrilling cultural encounter. Before night fall, you will return to your Hotel / lodge for dinner. In the morning, you will gather at the park headquarters for briefing. You may either go for golden monkey tracking or hike up to Karisoke Research Centre, established by Dian Fossey, an American primatologist who dedicated all her life conserving the lives of mountain gorillas until she was killed and is buried there next to Digit, a mountain gorilla. You will learn more about the lives of the mountain gorillas at the research Center. On return, you will proceed to organize and pack up for your trip to Nyungwe forest national park. You will enjoy a special lunch consisting of Rwandan local dishes in one of the town’s en-route to Nyungwe. After lunch, you will continue on the journey to Nyungwe Forest, where upon arrival you will check-in to your hotel/lodge for overnight stay. Dinner will be served at the lodge. After breakfast, your Explore Rwanda Tours guide will take you to the park headquarters for a chimpanzee tacking briefing. You will then proceed to start your chimp tracking, searching for the active and playful fellows in Nyungwe forest. The Chimpanzees are the easy to spot, as they jump from one tree to another, chattering and laughing. Chimp tracking usually takes about 3 hours. You will then return to your accommodation for lunch. After lunch, you will go on a walking trail that will take you to the Canopy Walk, a swing bridge 50 meters in length that is suspended from large trees. You will be able to see the amazing rain forest with a bird’s eye view, spotting wildlife moving about below you. Before night fall, you will return to your hotel / lodge for dinner. After breakfast, you will pack up and begin your journey back to Kigali. Upon reaching Kigali, you will go for a Kigali city tour. You may also visit the genocide memorial site at Kigali. Thereby ending your 7 day Rwanda tour. Your Explore Rwanda Guide will thereafter take you back to your hotel or Airport.